The dry milling of ore in Loesche vertical roller mills has shown significant process advantages, as well as economic and ecological benefits. To demonstrate these, a mobile ore-grinding plant, the OGPmobile, has been developed. This allows the customer to test the effectiveness of Loesche’s grinding technology and its influence on the total material flow of the existing processing plant. The degree of mineral liberation, particle size distribution, energy consumption and throughput can be optimised individually for each deposit and each treatment process, depending on the ore characteristics. Past experience shows that these benefits are achievable on various ore types with differing characteristics, such as lead/zinc and nickel. The OGPmobile is a fully functional grinding plant, which is comparable with the test circuits in the Loesche Test Centre in Neuss, Germany. The flexible circuit allows operation in an airflow as well as in overflow mode without gas sweeping. Large samples of milled material – 200t-300t for further direct processing in subsequent process steps – can be produced. The quality of the milled products is checked by analysis in the integrated laboratory. 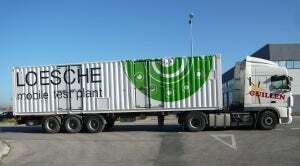 The OGPmobile consists of three 40ft-high cube sea containers, which makes global transportation easy. The mechanical equipment for grinding, sizing, material handling and product separation is installed in two containers. In the third one, the laboratory and process-control system is installed, along with the control room. The minimum requirements for operating the OGPmobile are an appropriate power supply and a compacted base measuring approximately 17m x 7m. The first OGPmobile is currently being used in southern Asia, where its transport to site was handled by Loesche logistics experts. The operation of the facility and the testing programme are being carried out in close co-operation between the customer and Loesche specialists. After this series of tests has been completed, further deployments are planned.